When I was in high school, I used to be involved in the desktop publishing department. Essentially, I was a yearbook geek. In most places, you receive your yearbook towards the last month of school. I’ve even heard of some schools distributing yearbooks from the previous year in August! In addition to the regular yearbook, our academy released a “pre-yearbook” in the first month of school so we can get used to all the (few) new faces. I’ve also attended other institutions with a similar publication. They called it “The Dating Catalog” or “The Mugshots.” We called ours the “JCA Buddy List.” That year, we designed the pages in sharp color as opposed to the previous year’s blurry black-and-white. When the cutting-edge design was complete, I went into production. It took forever to print my “Buddy List!” “Forever” comprised of a whole 15 minutes. 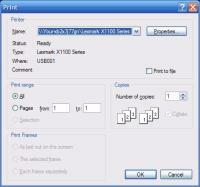 I checked the “Print Status” window and discovered the problem. Each side of the page I sent to the printer was at least 50 MB large! It wasn’t actually the printing that took long but the sending of the data. We used a high-grade laser printer. Printing one page took approximately 5 seconds. But sending the data via USB 1.0 cable – which is capable of “fantastic” burst speeds of 12 Mbps – took at least 1 minute! In my last article on the freeware review, I wrote about automatically saving multiple screenshots with smartision ScreenCopy. Try using this program with video. When I was trying to save a screen shot of one of my DVDs for my desktop wallpaper, I captured the entire screen … sans the actual video. Even when I tried pressing the manual “Print Screen” button on the keyboard I got the same result as I pasted the data in IrfanView. Why is that? I can never dump the screen of any video content? My first response was that it was a copy-protection mechanism, sort of like DRM. But the real, underlying problem was the way my media player rendered the video content.